In 1911 Albert John David Laskey, 17, was working as an errand boy. He later became a greengrocer’s assistant, working for the Lackey family business at 6 Industrial Terrace, Brixton. However, he was let go from there as business was slack, according to Thomas Lackey, who provided a testimonial to the Army on Laskey’s good conduct. 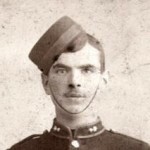 Lackey joined the East Surrey Regiment on 3 August 1913 at Kingston-on-Thames as a private. Laskey lived with his family in four rooms at 33 Edithna Street, Stockwell. 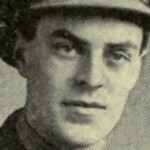 His father, William David, 46, was a “night porter (flats),” originally from Hempnall, Norfolk. His stepmother, Sarah Jane Eliza, 38, was from Islington, London. There were three half-siblings and two boarders. The physical description of Laskey brings to mind a solid, well-built man. He was 5 feet 6½ inches tall, 10 stone, with a 34-inch chest, to which he could add 2 inches. He had a fresh complexion, with brown eyes and brown hair, a scar inside her right knee and a mile to the right of his abdomen. 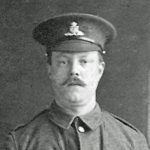 There was only one misdemeanour on Laskey’s conduct sheet: at Kingston he was absent for three hours on 18 June 1915, for which he was punished with five days’ Confinement to Barracks and the loss of five days’ pay. Nevertheless, in July he was promoted to Lance Corporal. 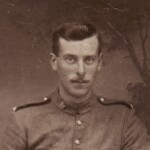 Laskey went missing on 1 July 1916, the first day of the Battle of the Somme, when 19,240 men died during what became known as the Battle of Albert. His family now had an agonising wait to discover what had happened to him. 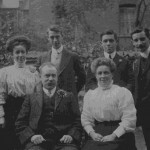 On 19 September his wife, Florence Lily, wrote from her home at 55 Victor Road, Teddington, “I am asking if you [have heard] anything more of my husband. … He was reported missing on July 1st.” His stepmother wrote too. 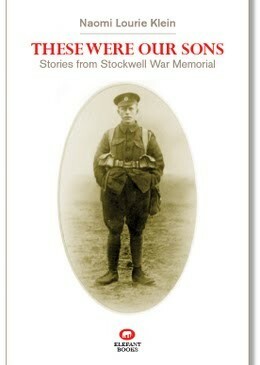 “Will you please let me know if you have any definite news of my son,” she pleaded on 26 March 1917. 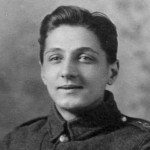 But Laskey’s body, like so many, was never found and he is remembered on Thiepval Memorial where those soldiers known only “to God” are listed. 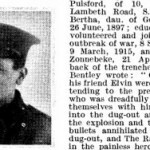 There were 2 boarders: William John Rivers Willson, 50, a travelling coalman, born in Greenwich, and Ray Thorley Hepworth, 24, an actor from Leeds.